Since worn component parts can cause serious problems, OEMs recommend replacing the EPDM grommet, valve cap, valve core and sensor nut every time a TPMS sensor is removed from the wheel or the wheel is serviced. Replacing the critical valve component parts every time ensures an air-tight seal allowing the system to function properly. TPMS Parts Assortment #1 includes all of the necessary component parts to service most TPMS sensors for Chrysler, Ford and GM. 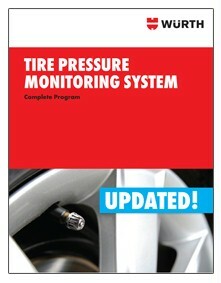 TPMS Parts Assortment #2 includes all of the necessary component parts to service most TPMS sensors for Acura, Audi, BMW, Honda, Infiniti, Kia, Lexus, Mercedes, Nissan, Saab, Subaru, Suzuki, Toyota, Volkswagen and other miscellaneous imports. Each assortment kit is barcoded and color coded for easy identification.